Need answers to common questions? Click on a question below to go to the answer. Why is it asking me for the password every time I click on a link to a different page within the newsletter? How do I avoid adding a username and password every time I try and log into the newsletter? Why is it taking me to the member page after entering the correct password? How do I enable cookies in Google Chrome? Clear the Don’t download pictures automatically in HTML e-mail messages or RSS itemscheck box. How do I update my contact details or change the password on my account? How do I upgrade my plan from a Trial to a Paid Subscription? Please try checking your spam folder and mark the email as Not Junk. Also ensure that your mailbox is not full and has enough space to receive emails. You may also have accidently clicked the Unsubscribe link in the email, in this case please contact us so we can add you to the email list. How do I avoid the email from going into the Junk folder in Outlook? This is the email address that you used to register for your free trial or paid subscription. What do I use for the password? This is the password that has been emailed to you once you have registered for any of our subscriptions. Please ensure you have typed your email address correctly to receive your password. Do I need the daily email to view the newsletter? No, the email is just a reminder and only shows a quick overview of what’s inside the newsletter. How do I save the address of the newsletter in the web browser Toolbar to automatically log me in? How do I refresh my web browser to check for the latest information? How do I increase or decrease the size of the text in my web browser? I can log in from my computer but can’t log in using my iPad. What should I do? If you have blocked cookies on your iPad, you will need to allow cookies in order to log in to the Marcus Today newsletter. Use “From third parties and and advertisers” or “Never”. Any of these two options will work. Use “Always Allow” or “Allow from websites I visit”. Any of these two options will work. Open the Safari App on the iPad, go to marcustoday.com.au, and log in using the normal method you use on the computer. How do I save the Marcus Today website as a button on iPhone or iPad in iOS 8? 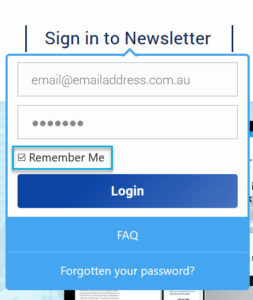 Click on remember me to save your password, in order to save you time next time. Click on the Go button so sign. You may be prompted with the following scree. You are all done. If you saved your password, it should log you in automatically next time you click on the icon. How do I view and delete passwords in Firefox? Click Saved Passwords… and the Password Manager will open. To remove a username and password, select it from the list and click Remove. To remove all stored usernames and passwords, click Remove All. After confirming this choice, all of your stored usernames and passwords will be deleted.